Sigh school work in the holidays :(. It was rare for Ai Ma to endure such a thing, yet she managed since she knew what events were to come: someone else would help her educate this Bi Er that didn’t understand etiquette. At this time, Tuo Ma Si was currently joking around with a few others as though the atmosphere wasn’t tense with the feeling of drawn swords and raised bows. Ai Wei Er had come as well, but she was currently surrounded in a circle by some aunty-grade females and could not escape. All of the large entities of Ye Lu Samo had come, and the most endlessly dazzling of them would be Ye Lu Samo’s four heads of the city. The Magistrate, Sa La; the Spirit Engraving Masters Guild President of the Ye Lu Samo branch, Sa Mu Andun; the Ye Lu Samo Temple’s Head Priest, Tuo Ma Si; and the War Academy’s Headmaster, An Qi Luo1. It was very obvious that Sa La and Sa Mu Andun were collaborating together, and except for An Qi Luo, all of the occupational guild presidents were all weeds swaying with the wind. An extremely handsome Fu Ke Si walked out, a smile on his face as he waved at his surroundings. It looked as though such a setting did not bring him any pressure. “Bu Qi? Could it be the Bu Qi from the Provincial Spirit Engraving Masters Guild?” the crowd followed along and spiritedly discussed. The Spirit Engraving Masters Guild was always everyone’s focus, and the youths with future prospects would be even more interested. This youth named Bu Qi was a primary focus for the Holy Province to nurture and he even had a record of creating a set of plain-grade equipment in a single hour. Bu Qi was born in an Engraving Master family and was nicknamed the Swift Knife Hands. He was also handsome with boundless prospects for the future, and within the circle of youths of Da Luo Si, he was a very influential person as well. At the mansion, there was no small amount of beautiful girls that had already started to emit stars and even Ai Ma’s delicate face was red. Ah, girls, they all loved handsome boys, how could all Fu Ke Si be born with such a pretty-boy face, while even just a glance at Zou Liang’s Bi Er face showed it was just that of a support character? Soon, a scene of praise resounded out with the intention of making some connections with Bu Qi; this youth was truly someone with a bright future ahead. Bu Qi’s reaction to the praise was very appropriate, neither servile nor overbearing which gave face to many people. Zou Liang only coolly glanced from afar while knowing that this brat was actually very cocky. “What boundaries? We’re all contributing to Ye Lu Samo City; there’s no distinction between each faction,” Sa La said. This had been anticipated but there was no other way; they had already been put in a passive position so they could not afford to be cowed. When Ya Se had come to the scene, there was no amusing speech like before and those noble young ladies all glanced at this silly-looking Bi Er with astonishment. No matter how these ladies looked at him, they still felt he was far too unfitting for this banquet. And since when could the Bi Er tribe give rise to an Engraving Priest? Zou Liang’s large mouth cracked open and showed the expression of a silly laugh. This foolish look cased everyone present to burst out into laughter. “I’ve been looking forward to meeting this famous one. Uncle, would I be able to compare notes in techniques and assist in livening up the mood a bit?” Bu Qi said with both warmth and elegance; he had come from the capital and his bearing wasn’t ordinary. In reality, he had come this time specifically to help out Sa Mu Andun, otherwise why else would he come to such a countryside place? He did not think that by coming to such a small city he would find no small amount of fresh beauties. Sa La’s daughter was pretty good, and not too far away there was also a stunning Rui Bo Te; it could also be said that this journey would bring him some benefits as well. Tuo Ma Si gloomily cursed beneath his breath. The conversation had already been decided, so what could he say? “Young people, right? Learning from one another is good, too, and whether it be victory or defeat they don’t need to be too hung up on it,” Tuo Ma Si replied with an uncertain heart. Even though Ya Se was very talented, a live performance required a little bit of everything. “Okay. However, I haven’t been learning for very long, so if I don’t do very well then everyone better not laugh,” Zou Liang replied with a silly smile while dumbly touching his head. In everyone’s eyes, the Bi Er tribe’s purpose was for manual labor and not suited for the stage, but most of the importance was placed upon Bu Qi’s performance. The young ladies had already been drawn in by the attractiveness of this handsome man who hailed from Da Luo Si. Bu Qi walked into the center and opened a Spirit Gathering Gourd. Under Bu Qi’s control, the Beast Spirit hovered in the air while he put out both of his hands. One, two, three Engraving Knives, their sizes all different and very delicate, and the blades mysteriously carved out a decorative design. Saying this, the three Engraving Knives were used in turn and the Beast Spirit in his hand speedily revolved. The whole process was like clouds atop flowing water, and this was something that could only be achieved through strict training while one was still young. Naturally, the surrounding people looked on with foolish expressions while a few guild presidents had their eyes wide open; it was not often that one could witness a Spirit Engraving Master’s technique with their own eyes. Everyone could not stop nodding as they watched. 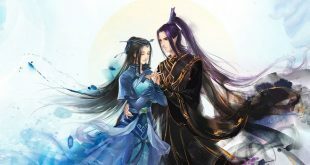 Bu Qi was a nurtured elite from Da Luo Si which was an extremely important point, and Sa Mu Andun was also very pleased. Youths were very high quality; their reactions were very quick and training from a young age up to fifteen was not without gains. With a relaxed style, a vivid and lifelike rose was born in his hands. Bu Qi’s Engraving Knife was clearly free-spirited and unrestrained. Ai Ma’s charming face turned pink, and in a single moment she had become the focal point of the entire audience and caused the other ladies to die out of jealousy. The applause sounded out, but the first to clap…… was actually Ya Se, applause immediately filling the scene. Tuo Ma Si had pretty much fainted at this. What was this brat doing? Wasn’t this being timid in a battle? “F**k! Ya Se, you haven’t gotten it wrong, have you? This rascal is quarreling with you, and we bet on your win!” Lan Di said while pulling Ya Se over while Ke Te nodded in approval to the side. “Gambling on good luck, I have bet a month of living expenses so you better not mess around!” Lan Di very earnestly said. “Can I bet?” Zou Liang asked. “Betting on yourself to win isn’t a good omen,” Ke Te advised against it. Ke Te and Lan Di had an impulse to commit suicide. “F**k me, don’t play like this! Stake everything! People in bare feet aren’t afraid of wearing shoes; you definitely have to win or Ke Te and I will live at the temple and leech off of you!” Money was a small matter, but they each had their own social circles and face was a large issue. It was Zou Liang’s turn. This rascal held his Engraving Knife, a knife that was like a dagger. It was crude—very crude—and when compared to the other person’s three Engraving Knives, this one was like a butcher’s knife suited for killing pigs.